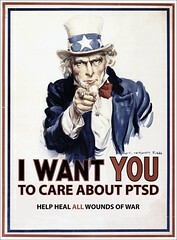 Between 2002 and 2008, nearly 50,000 veterans from the Iraq and Afghanistan wars received diagnoses of post-traumatic stress disorder. But fewer than 10 percent of those completed the recommended treatment of 10 to 12 weekly sessions within four months; the number only grew to fewer than 30 percent over a year, the study authors found. Some types of veterans are less likely to receive recommended care: males, veterans who are under the age of 25, those who live in rural areas and those who got their diagnoses at primary-care clinics and needed referrals to mental health programs, according to the report published online Feb. 9 in the Journal of Traumatic Stress. Dr. Karen Seal, the study's head researcher and a practitioner at the San Francisco Veteran Affairs Medical Center, said in a news release that most veterans did attend at least one mental-health appointment. But problems -- including those at the system and personal levels -- led to lack of follow-up.